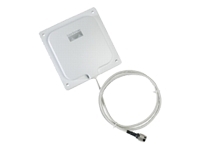 The AIR-ANT2485P-R is a wall mount indoor/outdoor antenna with a RP-TNC connector-Designed for use with any radio that features a RP-TNC connector. For use in the 2400-2500 MHz frequency band. The plenum rated pigtail cable is 36" long.